Phantasm, from the animated theatrical release Batman: Mask of the Phantasm (1993). An “Angel of Death” appears in Gotham City, a shrouded executioner with a skull-like faceplate, slicing through crimelords with a wrist-mounted scythe, then vanishing supernaturally into a wisp of fog. Batman is blamed for the murders, placing the Dark Knight in double jeopardy as he hunts down this vexing vigilante while evading an unremitting police force. Complicating his life is the return of Andrea Beaumont, the first love of the man behind the Bat-mask, Bruce Wayne. And thus begins one of Batman's most personal stories, his heart torn asunder by a flame that still flickers, and his flesh endangered by the blade of the merciless supervillain known as Phantasm. This most poignant of Batman stories … is a cartoon. Batman: Mask of the Phantasm, a 76-minute animated film directed by Eric Radomski and Bruce Timm, was released theatrically on Christmas Day 1993. A spin-off of television's Batman: The Animated Series (1992–1995), Phantasm was envisioned as a made-for-video feature but was upgraded to theatrical status shortly into its production (to producer Warner Bros.' chagrin; the movie performed poorly at the box office, but it later became a home-video favorite). 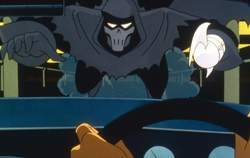 Phantasm was inspired by the Reaper, the slayer in DC Comics' 1987 “Batman: Year Two” storyline. While not as graphic as comics' Reaper (to maintain the film's PG rating), Phantasm's screen presence was buttressed by atmospheric moodiness—the villain's emergence from and disappearance into the fog, plus eerie orchestral nuances by soundtrack composer Shirley Walker— that might have escaped the character had Phantasm originated on the comic-book page. Although the film's revelation (spoiler warning!) that Wayne's love interest Andrea (Dana Delany) was actually Phantasm surprised only the acutely naive (as well as a few little boys who bought the tie-in Phantasm action figure, removed its forbidding cloak, and gasped, “Hey, it's a girl!”), the exceptionally well-made, Art Deco-esque Mask of the Phantasm was, until the release of 2005's live-action Batman Begins, regarded by many Dark Knight devotees as the best Batman movie ever produced. In every encounter Veronica has with the phantasm it causes some sort of physical harm in the form of bruises or bite marks. That means even sensible species retained in phantasms are not intelligible unless abstracted from the individuating conditions. Syrian and other refugees from the Arab and Muslim world are drawn to Europe and to Germany in particular, by the spell of a political phantasm which is informed by more than just social realities, economic forces, and political intransigence. Originally given the test name "Project Scissors" the game almost looks like a direct sequel if the trailer given can be trusted, with the isolated setting and the stalking of a familiar phantasm. But unlike paintings that address the pervasiveness of altered states amid creativity, and more explicitly the topic of the drunk artist, as in several self-portraits by Kippenberger, Singer's work presents the alcoholic artist as a phantasm complete with beret perched atop an already formless head. As a representational phantasm the poem is always and of necessity but a futile attempt by the subjective soul to achieve objective, intersubjective universality. Carried away by our myriad netsurfing experiences, we are feeding a collective phantasm of limitless knowledge, deluding ourselves into believing that accessing information in real time is the same as immediate knowledge. A favourite among horror and fantasy aficionados, Coscarelli wrote and directed a quartet of Phantasm frightfests between 1979 and 1998, as well as Beastmaster (1982) and the brilliant cult favourite Bubba Ho-Tep (2002). 9) Thus the phantasm, as well as the external and internal senses on which it depends, serves as a sine qua non of human understanding. Drawing from his complex mental state, the author creates an intriguing world of phantasm and obsession. Following Saad, one could speak of the really existing Islamic state in contradistinction to a phantasm of a state ever deferred.